Updated Tuesday July 11, 2017 by Nashua Cal Ripken. Hollis and Nashua battled for the first 3 innings, wand Nashua took the lead for good with six runs in the fourth. Nashua had nine hits in the game, with Andrew Byrne, Michael Witkowski, Nick Sanossian, and Gavin Asimakopoulos each collecting multiple hits for Nashua. Hollis collected ten hits in the loss. Nashua's pitching was superb, giving up no walks on the day. Kyle Emmons started on the mound and pitched three solid innings with 4 strikeouts. Michael Witkowski finished it off for Nashua, striking out 6 and ending the day with a 1-2-3 top of the sixth. Witkowski also collected the game winning RBI on a 4th inning double. Nashua advances in the winners bracket and will plays Swanzey on Sunday morning at 10 am. 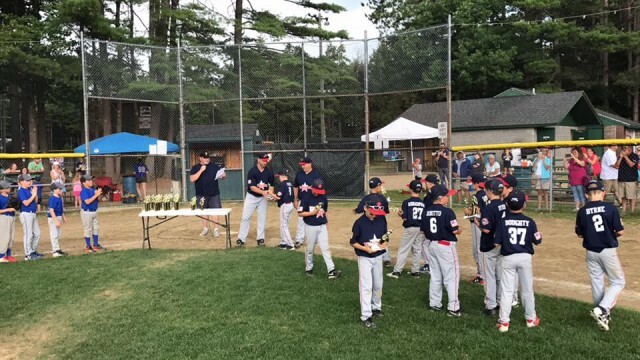 Nashua Cal Ripken League 9U All Stars defeated Swanzey 9-8 in a back-and-forth game on Sunday. Michael Witkowski, Nick Sanossian, and Gavin Asimakopoulos each collected multiple hits for Nashua, with Witkowski also collecting 3 RBI. Starting pitcher Anthony Dinitto struck out 5 and had the game winning RBI for Nashua. Nashua moves on in the winners bracket to play Kearsage Mountain in Keene on Wednesday evening.